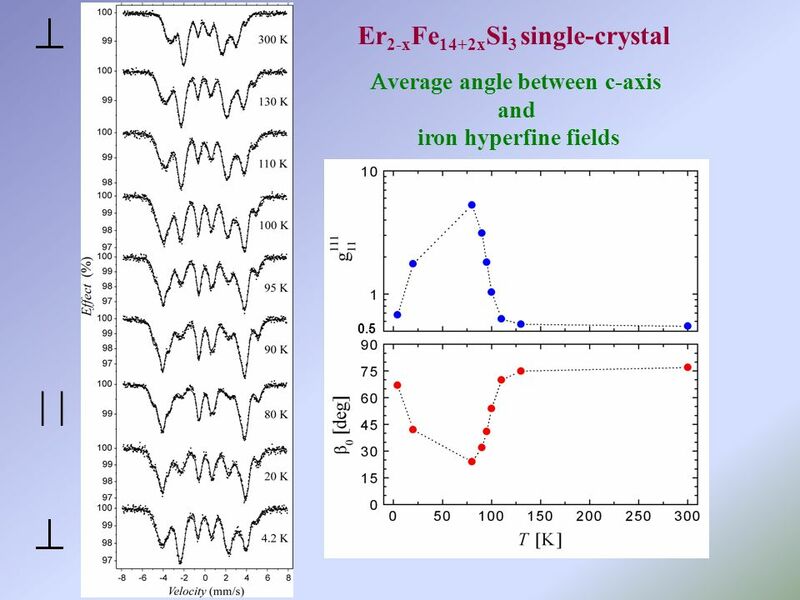 Spin reorientation in the Er 2-x Fe 14+2x Si 3 single-crystal studied by Mössbauer spectroscopy J. Żukrowski 1, A. Błachowski 2, K. Ruebenbauer 2, J. Przewoźnik. 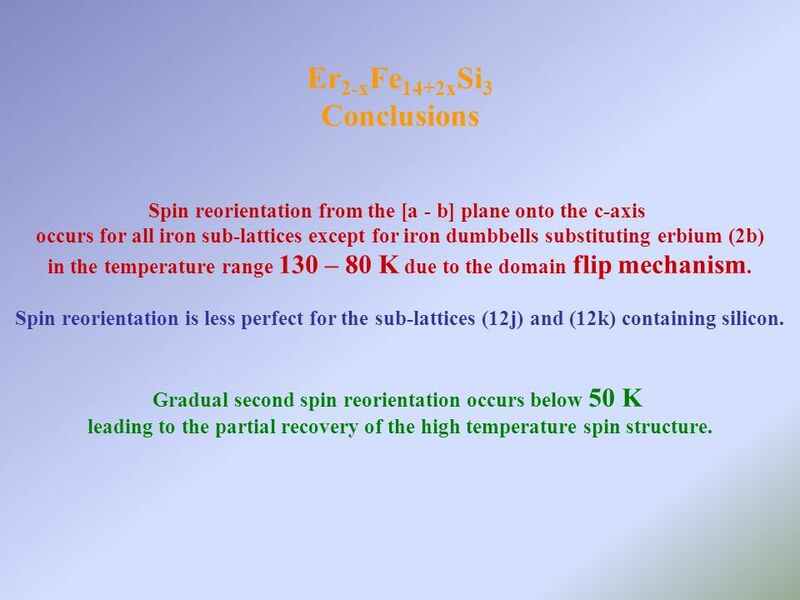 8 Er 2-x Fe 14+2x Si 3 Conclusions Spin reorientation from the [a - b] plane onto the c-axis occurs for all iron sub-lattices except for iron dumbbells substituting erbium (2b) in the temperature range 130 – 80 K due to the domain flip mechanism. Spin reorientation is less perfect for the sub-lattices (12j) and (12k) containing silicon. Gradual second spin reorientation occurs below 50 K leading to the partial recovery of the high temperature spin structure. 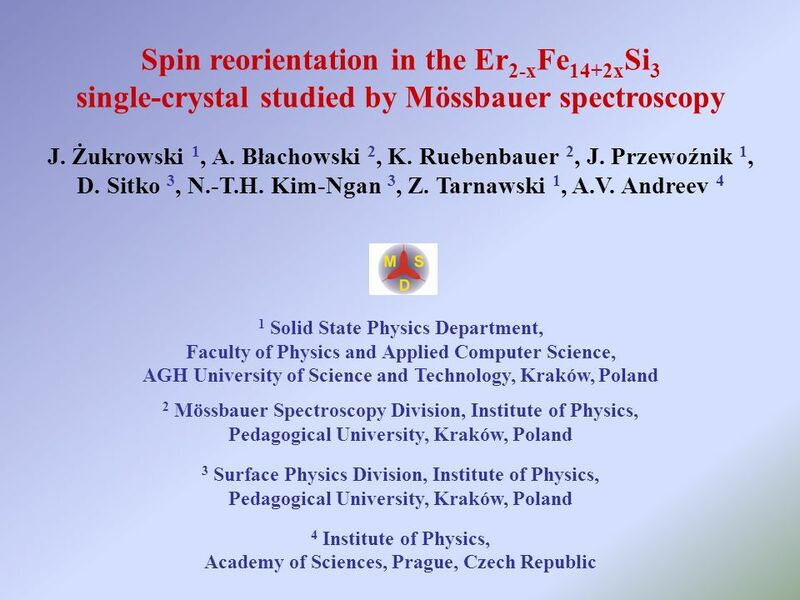 Download ppt "Spin reorientation in the Er 2-x Fe 14+2x Si 3 single-crystal studied by Mössbauer spectroscopy J. Żukrowski 1, A. Błachowski 2, K. Ruebenbauer 2, J. Przewoźnik." 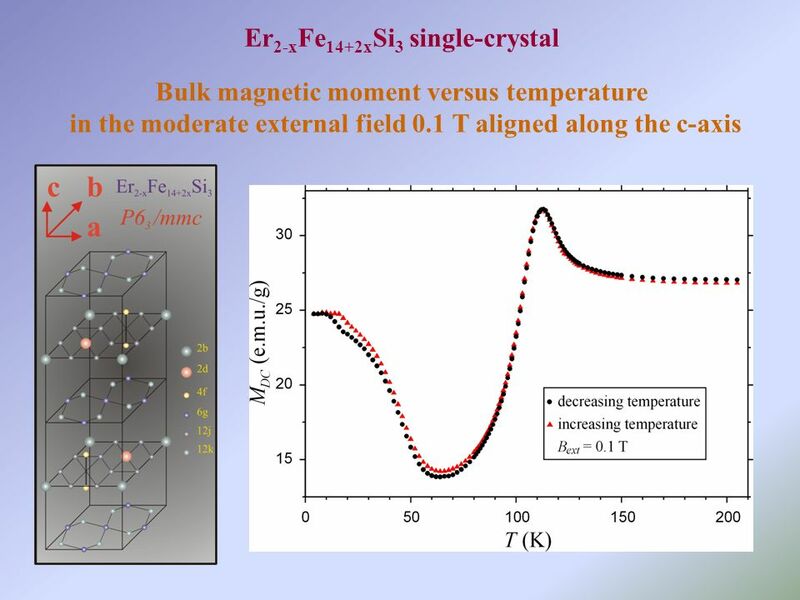 Mössbauer Spectroscopy under Magnetic Field to Explore the Low Temperature Spin Structure in a Molecular Layered Ferrimagnet A. Bhattacharjee, P. Gütlich. 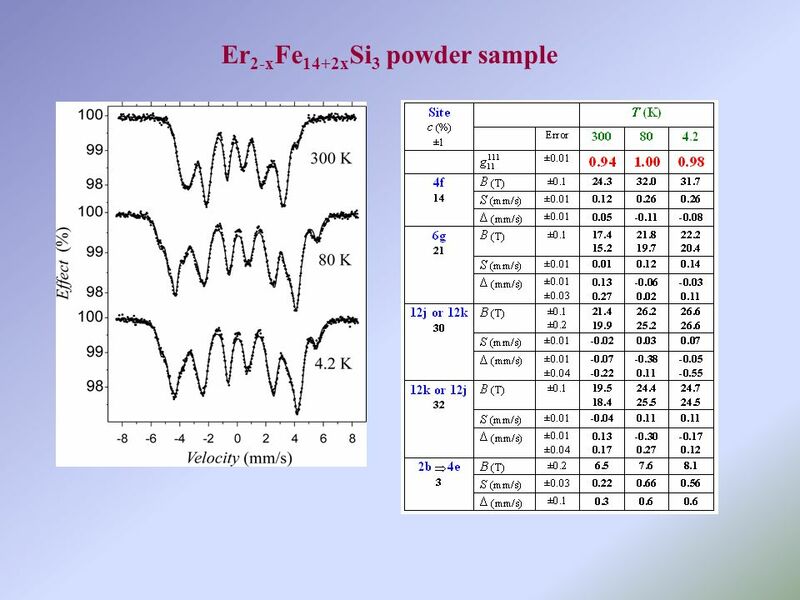 Site occupancies in the R 2-x Fe 14+2x Si 3 (R = Ce, Nd, Gd, Dy, Ho, Er, Lu, Y) compounds studied by Mössbauer spectroscopy A. Błachowski 1, K. Ruebenbauer. 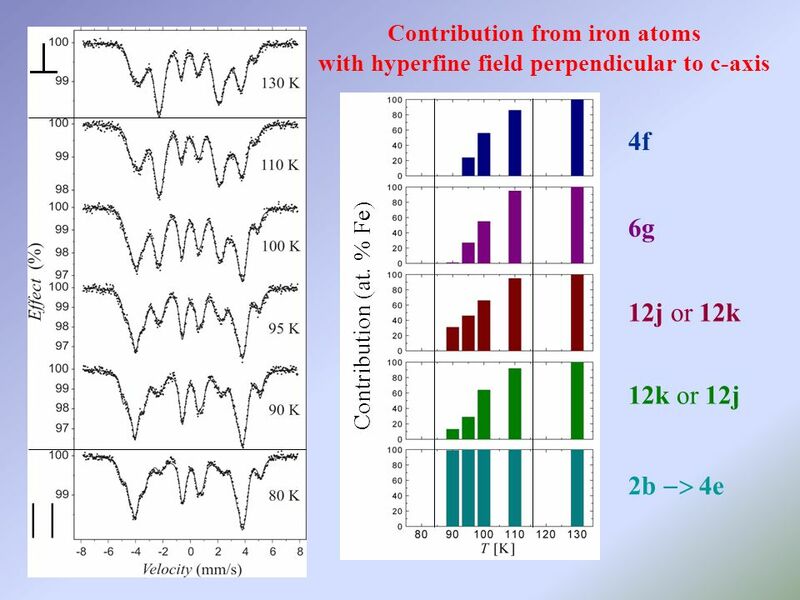 Fractal behavior of the BCC/FCC phase separation in iron-gold alloys Artur Błachowski 1, Krzysztof Ruebenbauer 1, Anna Rakowska 2,3 1 Mössbauer Spectroscopy. Rare-earth-iron nanocrystalline magnets E.Burzo 1), C.Djega 2) 1) Faculty of Physics, Babes-Bolyai University, Cluj-Napoca 2) Universite Paris XII, France. 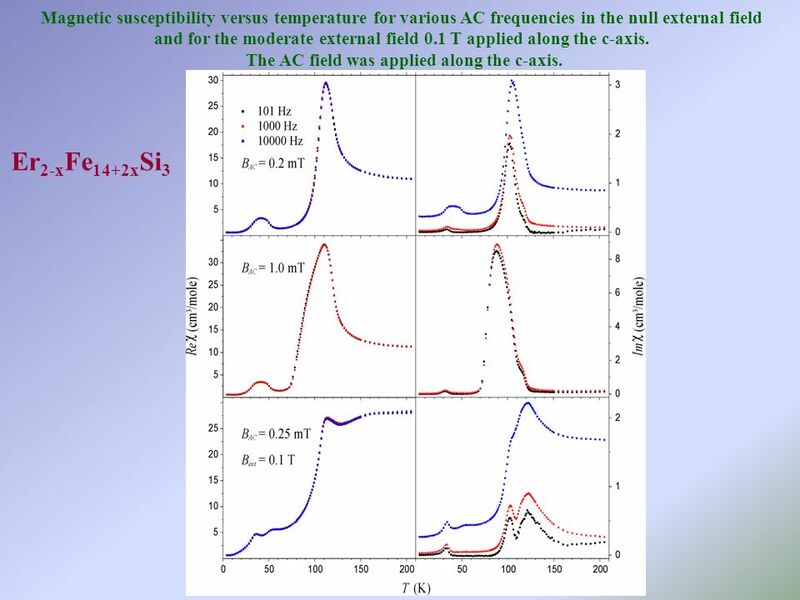 Origin of Thickness Dependent Spin Reorientation Transition of B2 Type FeCo Alloy Films Dongyoo Kim Applied Materials Physics, Department of Materials. 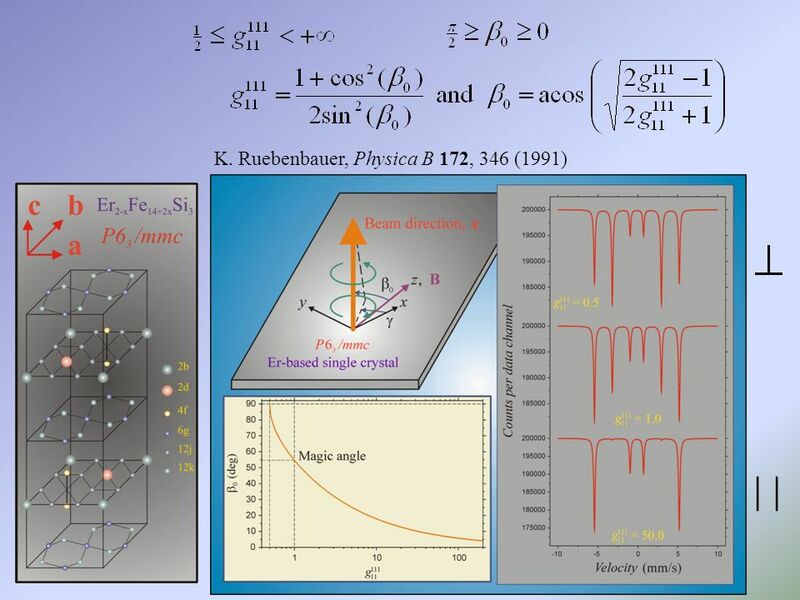 Focusing monochromators/analyzers Asymmetric diffraction geometry of the monochromator Dispersive double crystal monochromator Two wavelength sandwich. Fundamentals of Magnetism T. Stobiecki. Definitions of magnetic fields Induction: External magnetic field: Magnetizationaverage magnetic moment of magnetic. Electromagnetics (ENGR 367) Magnetic Materials & Magnetization. MRI. Magnetic Resonance 1.Principle first observed in Used for spectroscopy and imaging 3.Imaging techniques are a form of tomography, where slices. MSE-630 Magnetism MSE 630 Fall, 2008. MÖSSBAUER STUDY OF NON-ARSENIC IRON-BASED SUPERCONDUCTORS AND THEIR PARENT COMPOUNDS K. Komędera 1, A. K. Jasek 1, A. Błachowski 1, K. Ruebenbauer 1, J.